Hildy, who enlisted in the Navy right after graduation from high school in a small Minnesotan town, and Nick, who was drafted just before he planned to enter Princeton University, become close friends as part of the three-man crew of the lead plane of a squadron of Navy TBF Avenger torpedo bombers. Raspberry One tells the stories of Hildy and Nick in three parts: good times prior to shipping off to the Pacific on the aircraft carrier USS Shiloh, fighting at Iwo Jima and Okinawa, and recovery in a Brooklyn hospital from wounds caused by kamikaze attacks. This novel for young teens realistically depicts Pacific battle action, the relationship between Hildy and Nick, and their emotional difficulties when wounded and during recovery. However, their relationships with two young women, which play a key role in the book's first and third parts, seem somewhat artificial. The book's convincing battle scenes come from Charles Ferry's own experiences as a radioman-gunner on a TBF torpedo bomber during World War II. The book flap states that writing the book helped him understand his own experience in the war. Ferry has written several other young adult novels, including Binge (1992), which vividly describes the tragic consequences of teenage alcoholism. Although Raspberry One contains some technical naval and aircraft terminology that may be difficult for young teens, the author explains the meaning of difficult terms and acronyms, and the back of the book also has a four-page glossary. Part One begins with a social visit by the 48 young men of Torpedo Squadron 43 (VT-43), stationed temporarily at Mount Quonset Naval Air Station, to a reception held by the faculty and students of Wickford College, an exclusive women's school in Providence, Rhode Island. Nick and Hildy meet and fall in love with two students, Franny and Diane, respectively. The foursome spend their free time together for the next three months before the carrier Shiloh leaves Quonset Point in December 1944. The two couples' relationships both develop very quickly with no conflict, except Nick wonders a little bit whether his Catholic background may clash in the future with Diane's Jewish upbringing after they agree to get married. Hildy and Diane also grow close during their time together. She gives him a silver ID bracelet for his birthday with the engraved words of "To H from D, 12-8-44, with L." She also paints a stylish insignia decal of a red raspberry for his plane, which has the code name of Raspberry One, "Raspberry" referring to his squadron's code name and "One" signifying the squadron's lead plane. 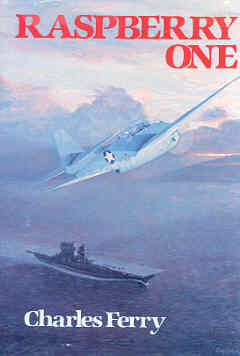 The novel's middle part describes Pacific battle action of Shiloh and her air group. Easygoing and confident Hildy, turret gunner on Raspberry One, develops a reputation as the squadron's best gunner. Nick, radioman and tail gunner, feels fearful as he approaches his first mission to hit Iwo Jima. Their squadron successfully carries out three weeks of bombing missions and combat air patrol (CAP) at Iwo Jima with no casualties. The next major operation of Raspberry Squadron's sixteen TBF Avengers is a torpedo strike against the Japanese battleship Yamato at anchor in Kure. However, Yamato and twelve destroyers moored at Kure open fire on the TBFs when they break through the clouds, and Japanese fighters also engage the attacking American squadron. The mission turns into a slaughter of the American torpedo bomber squadron with the best record in the task force until then. Only the three men of Raspberry One manage to escape and return to Shiloh, but the plane's pilot, squadron leader Lt. Comm. Scott, gets hit by enemy gunfire while leaving Kure and dies right after landing on the carrier's deck. Although Nick and Hildy return unharmed to Shiloh, a kamikaze plane soon after smashes onto the flight deck and its bomb penetrates to the hangar deck. Flying shrapnel severs Nick's right hand and lacerates Hildy's face. Three more kamikazes hit the carrier within ninety seconds, and the burning carrier is in danger of sinking. During the chaos after the hits, Hildy goes below deck and saves about 300 men trapped in the mess compartment, but he seriously injures his knee during the rescue. Damage control and repair parties manage to bring fires under control and keep the ship from sinking. Casualties total 714 men killed and missing and 265 men wounded, numbers almost identical to those of the actual carrier USS Franklin, which was hit by two bombs from a Japanese dive bomber on March 19, 1945, the same date kamikazes strike Shiloh in the novel. Also, just like Franklin in real life, Shiloh makes it back under her own power to Brooklyn Navy Yard for repairs. Part Three in the book covers the time spent by Nick and Hildy in a Brooklyn naval hospital as they recover from their wounds. This part depicts with sensitivity their struggles to come to grips with being disabled. Nick faces the future with optimism, and Franny encourages him with her frequent visits to the hospital. She even becomes a Red Cross volunteer to provide support for seriously wounded veterans at the hospital. Hildy, in contrast to Nick, becomes depressed and never really regains his previous cheerful personality. His knee ligament surgery fails, so the doctor plans further work on him at Great Lakes Naval Hospital north of Chicago. Diane never comes to visit him in the Brooklyn hospital, but she sees him one more time to say goodbye before he leaves New York and to give him a painting of Raspberry One climbing through broken clouds. Although four kamikaze planes change forever the lives of Nick and Hildy and references to kamikaze appear frequently throughout this novel, the author provides almost no details regarding Japan's suicide planes. Some information regarding Japanese kamikaze does not agree with actual history. For example, the book's first page mentions that in September 1944 Japan already had launched a kamikaze offensive, even though the Japanese Navy did not establish the first kamikaze squadron until late October 1944. One day in the fall of 1944, Diane says that she read in the newspapers that more carriers are required in the Pacific because kamikazes are sinking so many of them, but in actuality the military had a news blackout on Japanese suicide attacks and their results until April 1945. Charles Ferry, who fought in WWII as a TBF radioman-gunner just like Nick, realistically depicts the emotions of two young Americans who fought in the Pacific War. Raspberry One focuses on the bonds formed between Nick and Hildy and how they changed during and after battle, but the novel also provides young teens with a realistic description of activities carried out by a WWII aircraft carrier's air group. Adults may also enjoy this novel, especially the last part where Nick and Hildy recover in the hospital, but the depiction of their romantic relationships with the two Wickford College students lack depth and conflict.